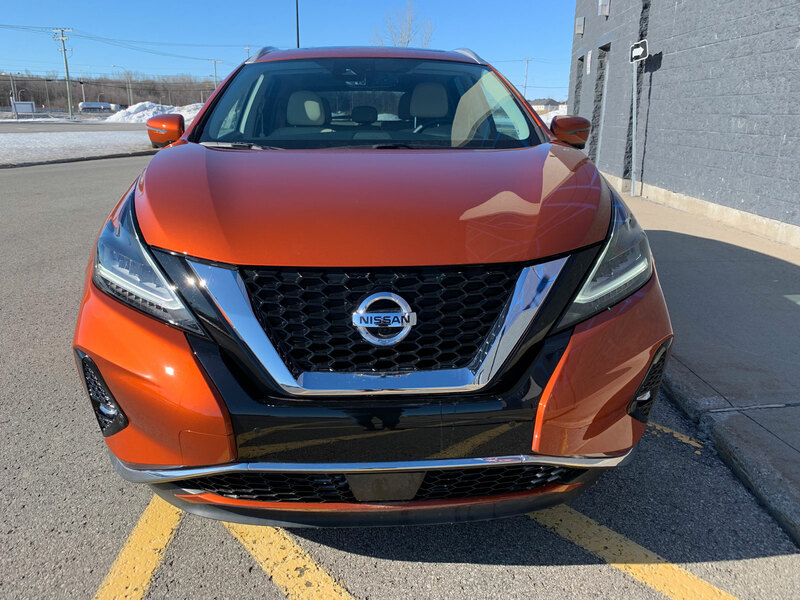 The Nissan Murano is a sleek and stylish mid-size SUV for people who don’t see themselves in the popular Rogue but also don’t necessarily want a big family hauler like the three-row Pathfinder is. 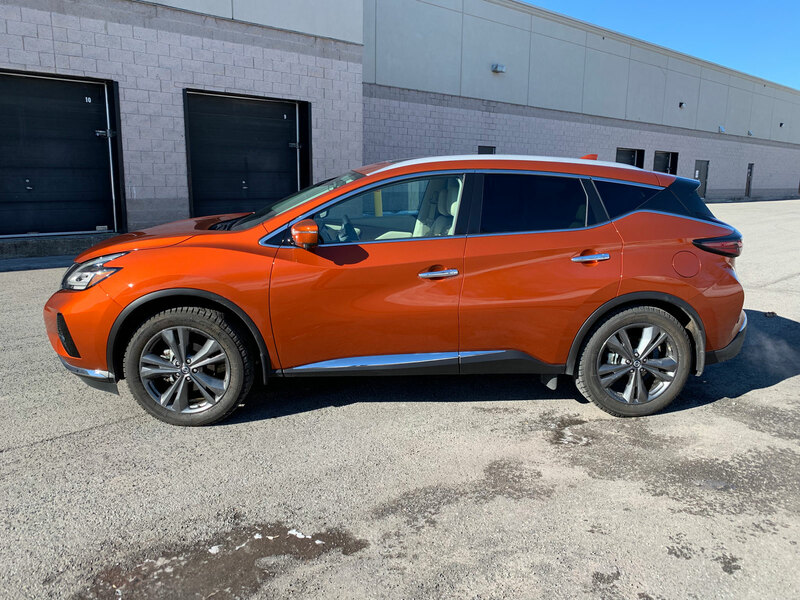 The Murano has stayed away from offering three rows and choses to focus on space, luxury and style which it accomplishes very well. 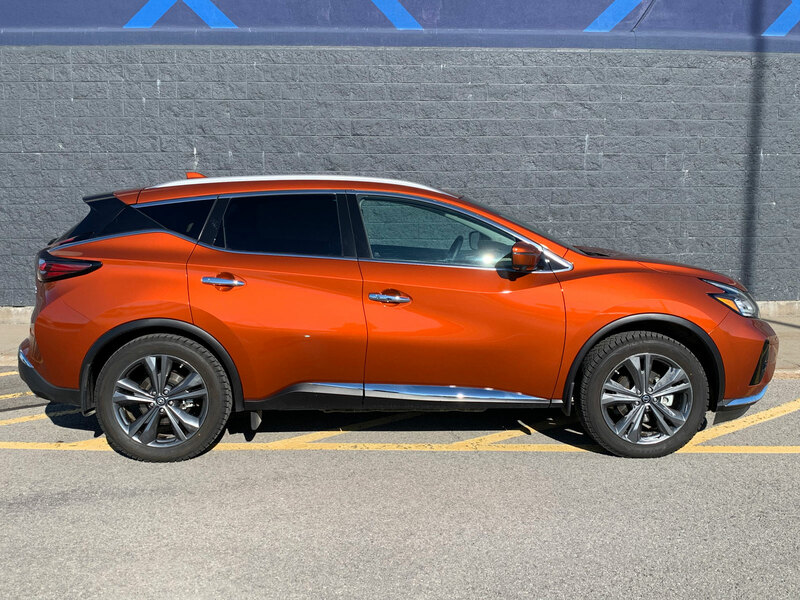 The Murano’s exterior styling is bold and very unique. There isn’t much else like it on the road and that’s a positive for a crossover looking to stand out. It’ll likely attract the eye of more mature buyers who have graduated from needing to haul their families and perhaps would like to treat themselves to something a little snazzier. 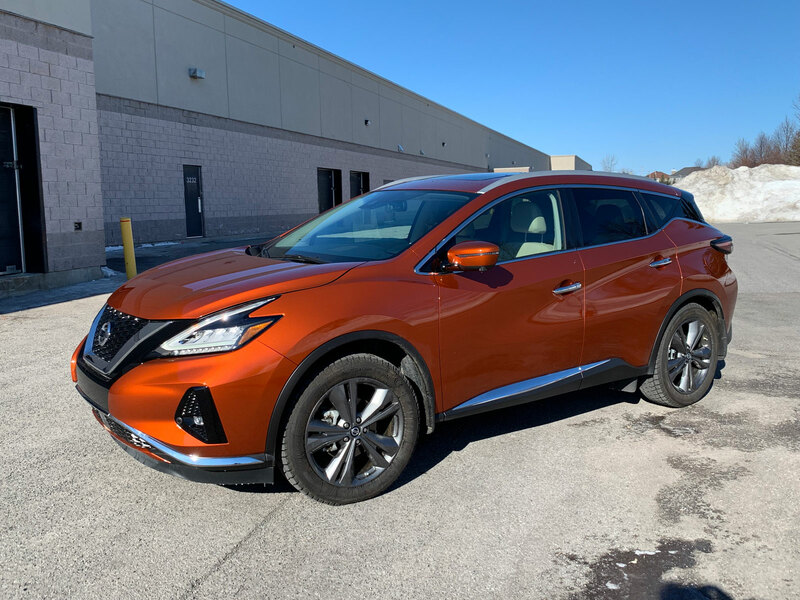 Now in its third generation, Murano receives a comprehensive refreshening for the 2019 model year. 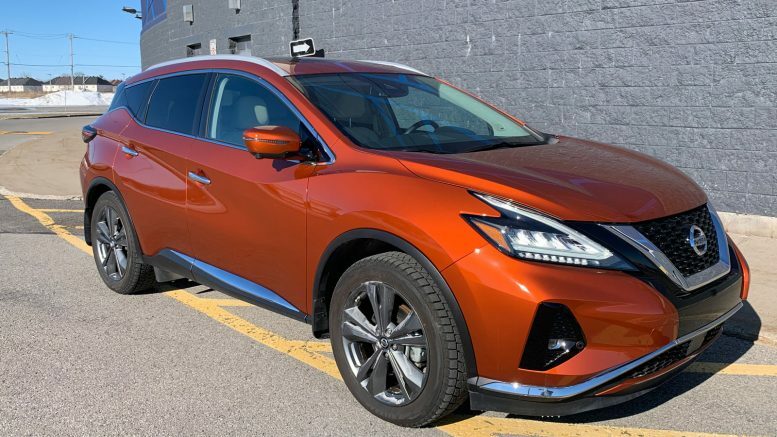 The revisions to Murano’s exterior add a more pronounced front V-motion grille, redesigned LED headlights and taillights, new LED fog lights, new 18-inch and 20-inch aluminum-alloy wheel designs and three fresh new exterior colors – Sunset Drift Chromaflair, Mocha Almond Pearl and Deep Blue Pearl. 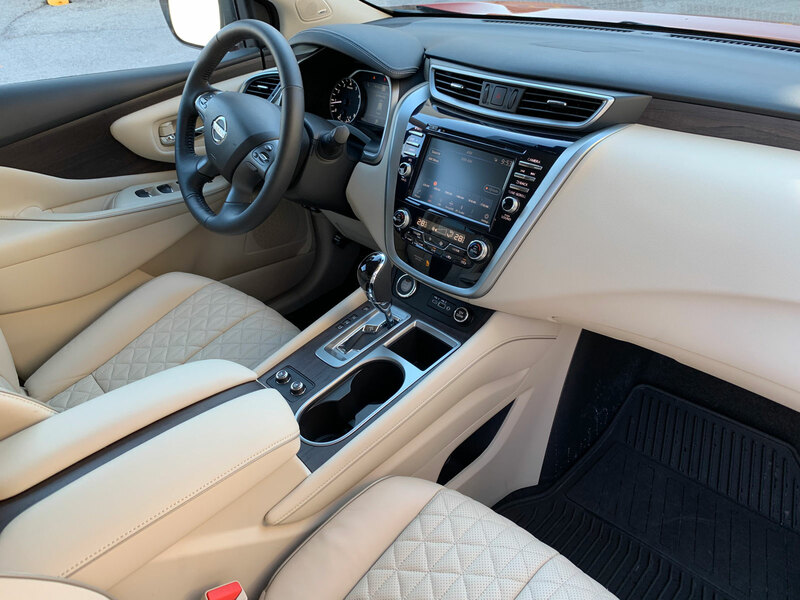 The cabin interior of the Murano Platinum is a wonderous place which envelops its occupants in the lap of luxury. 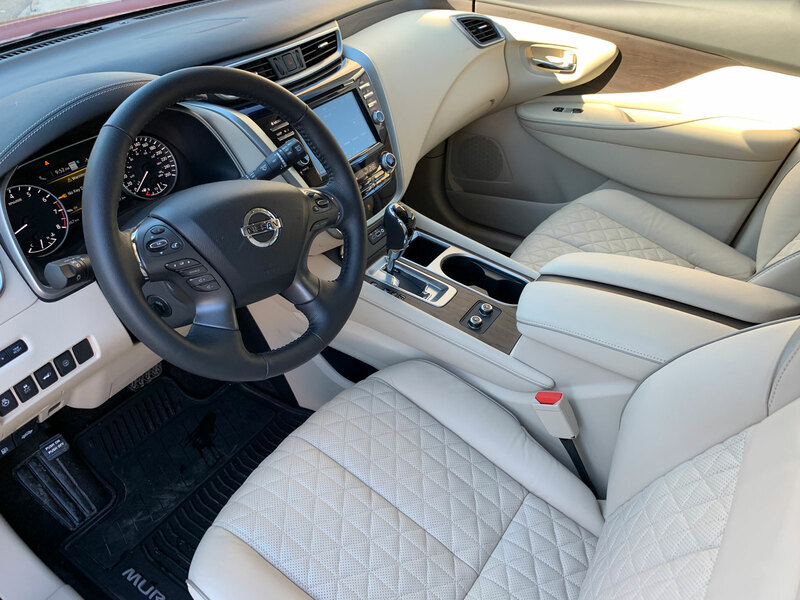 Enhancements to the interior this year are led by new semi-aniline leather-appointed seats with diamond-quilted stitching and contrasting micro-piping trim for the seats, door armrests and center console lid (Platinum only). The elbow room was fantastic as was the design. 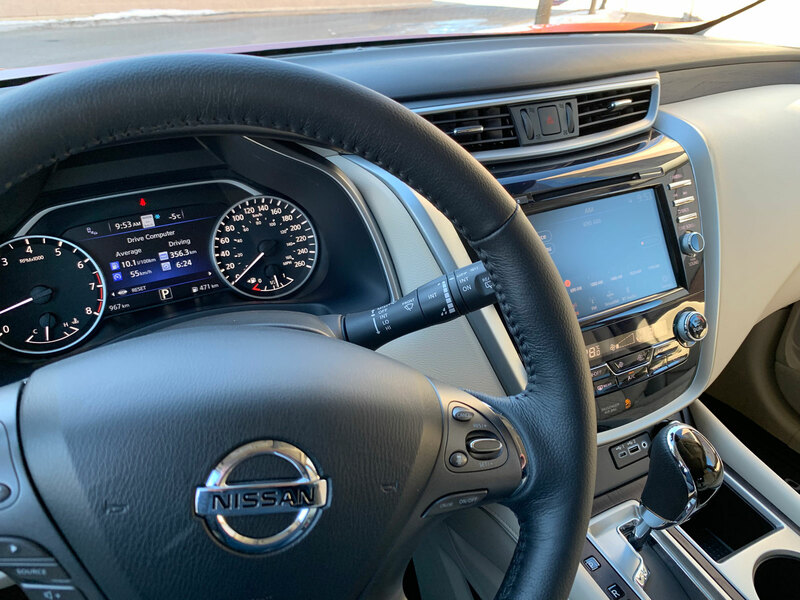 Props to Nissan for providing a standard gear selector instead of some electronic dial. Same goes for the climate controls and column knob. It’s a traditional design which has been perfected. 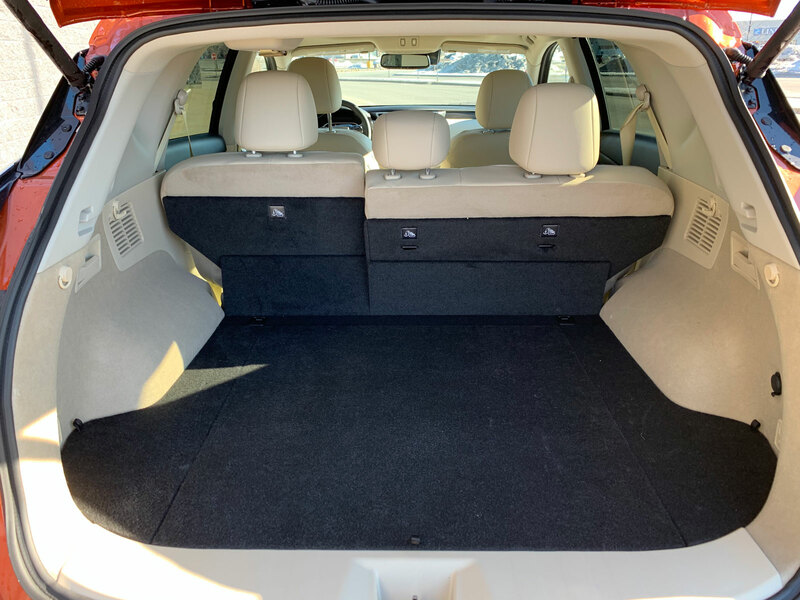 The trunk was cavernous and offered a ton of space (good thing because I had to bring my three boys to hockey practice and the bags fit perfectly). The power liftgate made the whole ordeal very easy. 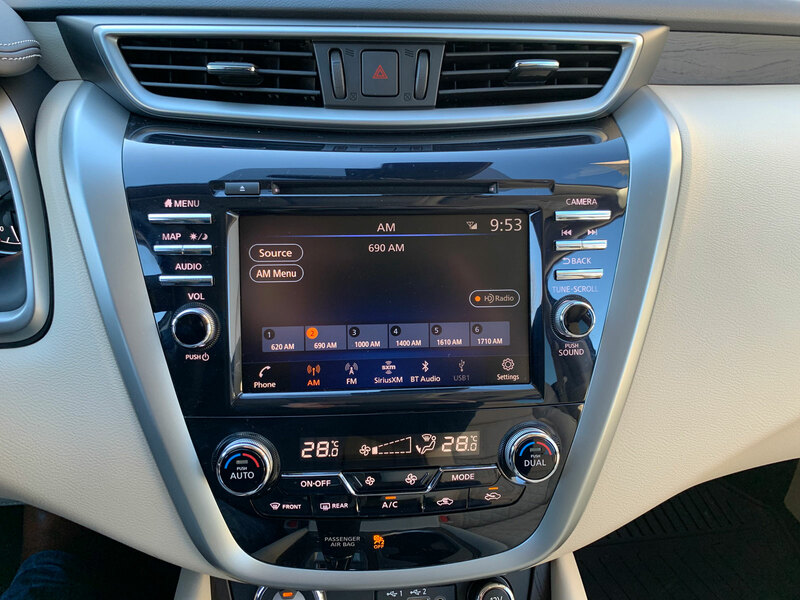 Nissan’s infotainment system is similarly very easy to use though we could do without the darn automatic weather updates. I couldn’t figure out how to turn them off and twice per trip a loud voice warned of an incoming winter storm. Nobody gets their weather from their car, Nissan. Heads up display would be a welcome option. 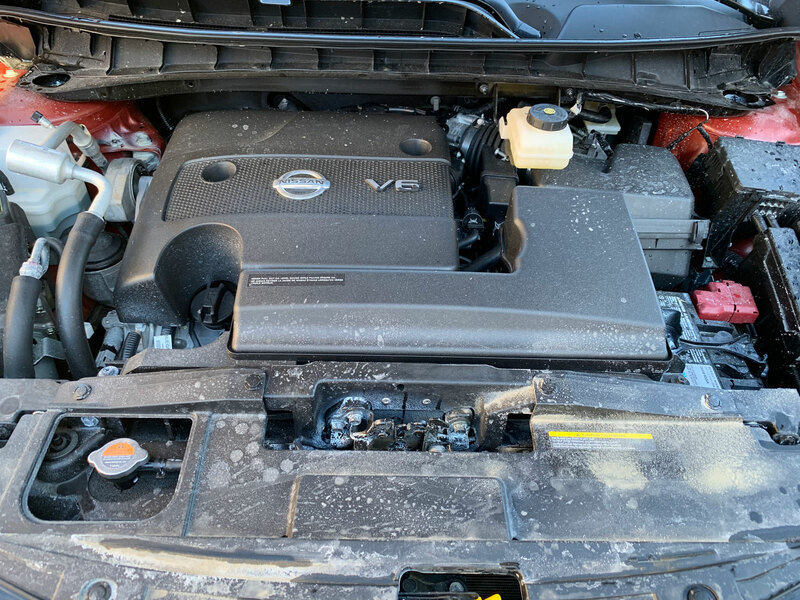 Under the hood there is but one engine option here which is the 3.5-litre V6 rated at 260 horsepower and 240 lb-ft of torque. 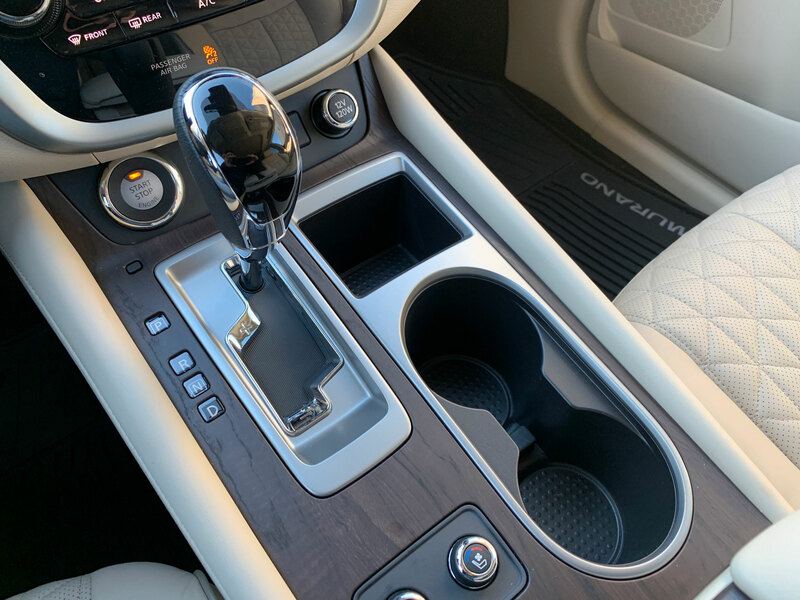 Also standard is a continuously variable transmission which the brand said has been tuned for quick response and smoothness. 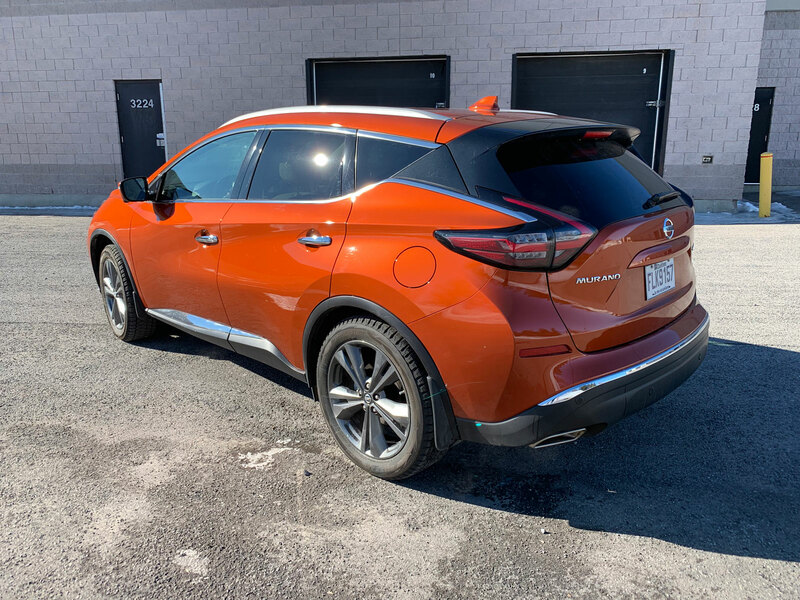 I do have to say that as far as boring CVT’s go, the Murano’s was one of the better ones I’ve had the pleasure of testing. It was smooth yet responsible and allowed the engine to power the crossover to highways speeds in no time with ease. 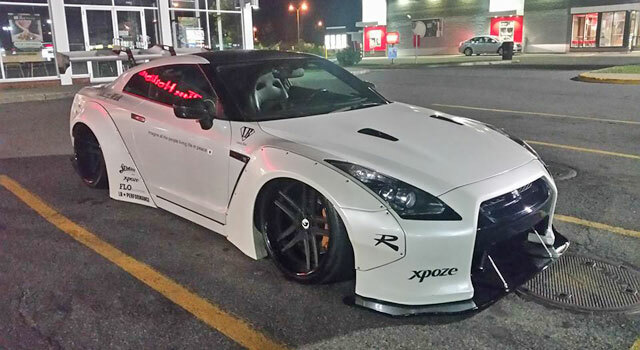 I thought it was a sporty and fun drive all around with very little to complain about. 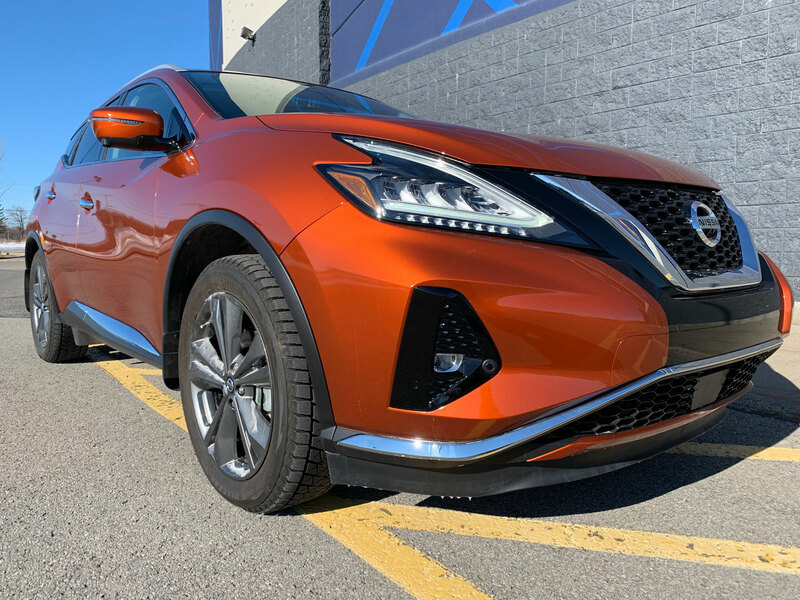 Safety features are aplenty on the Murano and there are a host of upgrades for 2019. 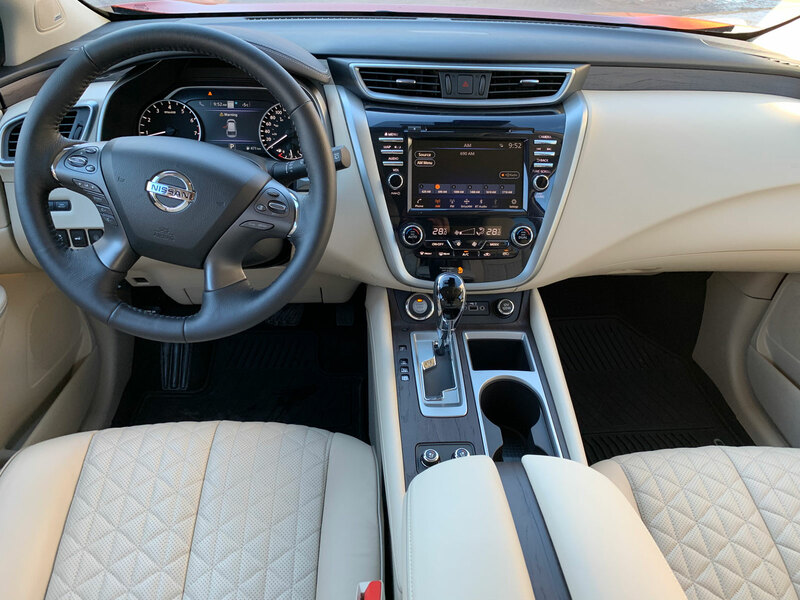 Every Murano includes as standard the Nissan Advanced Air Bag System with dual stage supplemental front air bags with seat belt sensors and an occupant classification sensor, front-seat mounted side-impact supplemental air bags, roof-mounted curtain side-impact supplemental air bags with a rollover sensor and a driver supplemental knee air bag. 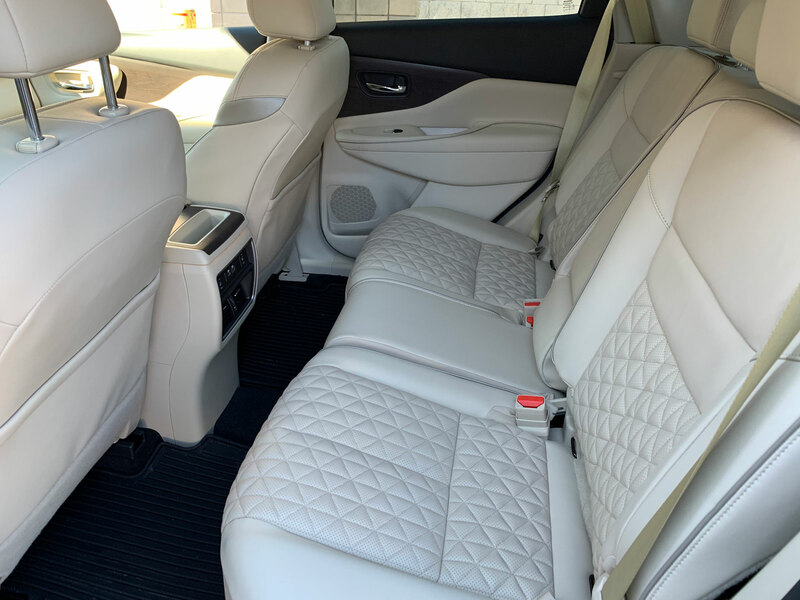 For 2019, a front passenger knee supplemental air bag and rear seat side-impact supplemental air bags have been added for a total of 10 air bags. 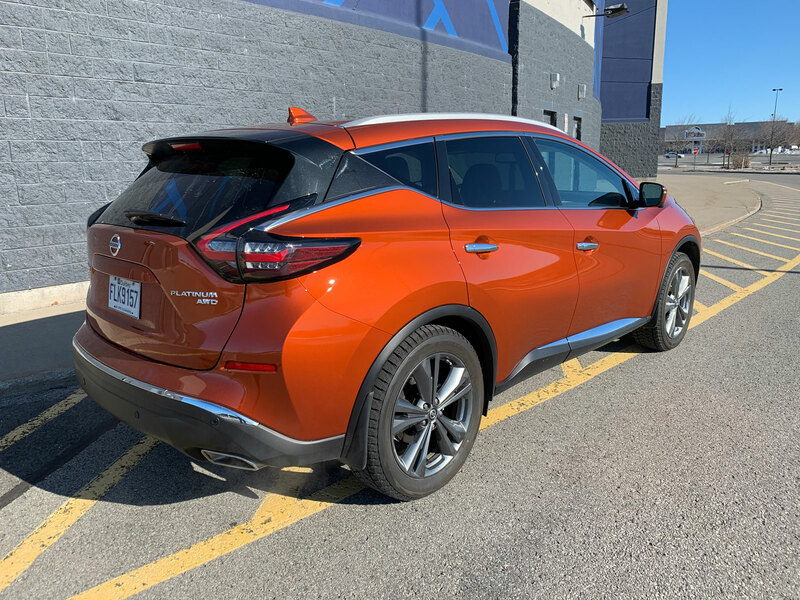 If you’re looking to get into a Murano there are four trims to choose from: S, SV, SL and Platinum. 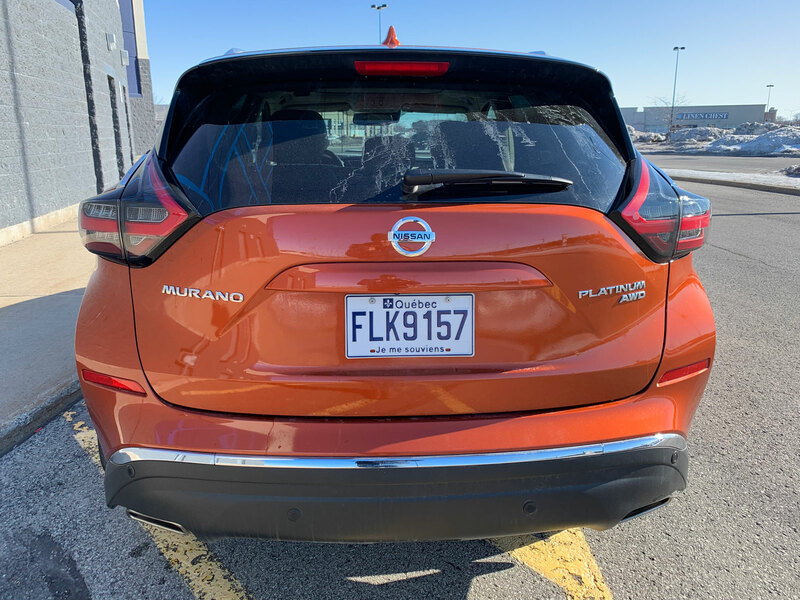 What’s nice is all 2019 Muranos feature NissanConnect featuring Apple CarPlay and Android Auto on the 8.0-inch touch screen. The S also featured Bluetooth, 18-inch wheels and four USB ports. The base S starts at $32,248. 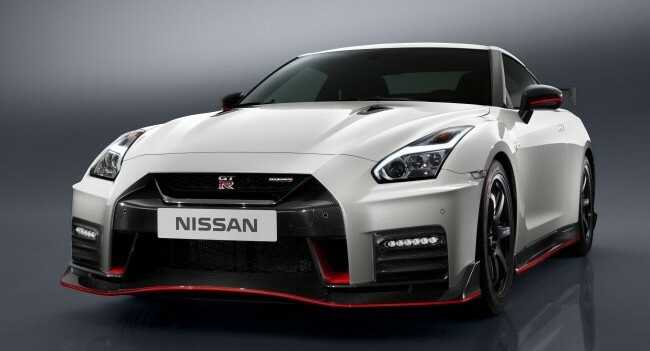 The $38,748 SV will add 10-way driver/4-way front passenger power seats, black roof rails, remote engine start, leather-wrapped steering wheel, leather-wrapped shift knob, auto-dimming inside mirror with HomeLink Universal Transceiver, Blind Spot Warning and Rear Cross Traffic Alert. Finally, the Platinum model that you see here has all the bells and whistles including a panoramic moonroof, unique 20-inch Dark Hyper Silver machined aluminum-alloy wheels, heated and cooled front seats, auto high beams (which is my least favorite option) automatic emergency braking lane departure warning rear automatic braking and the interior upgrades mentioned above for $45,998.